A major trend in 2019 for Frank Lepori Construction is growth in design-build delivery. The Lepori team has 18 design-build projects underway, accounting for 72% of their overall volume. The Sparks based general contractor delivered 58% of projects with design-build delivery in 2018. Design-build is popular in all types of construction. Of the 23 projects delivered design-build last year, the Lepori team worked in these sectors: hospitality, industrial, convenience store and fueling stations, commercial centers, community centers, retail, and restaurants. As a comparison, traditional delivery is described as hard bid. The general contractor doesn’t work with the owner until they submit the low bid, so they won’t be on board early enough to weigh in on the design. 1. All design and construction team members collaborate to make a great project from the beginning. 2. The overall schedule is shorter because design and construction activities can overlap at times. 3. The general contractor and design-build subcontractors provide pricing alternatives, so an owner can choose what they value most before finalizing the design and budget. The Lepori team designed and built Revision Brewery’s Sparks facility and has returned to help them grow their production. Hobey’s Casino in Sun Valley was transformed through recent design-build phases, including a new sportsbook, new bars, expanded gaming space, a new central kitchen and a new coffee shop. Truckee Tahoe Lumber Center on Hymer Avenue in Sparks is a great example of bringing an outdated warehouse up to code and structural integrity to deliver a great value. Using phased delivery to keep the dealership at 780 Kietzke Lane operational during construction, the Lepori team delivered a dynamic facility by collaborating with Architect Bob Hooft. Cutting construction time is consistently a benefit of design-build delivery, adds Frank. “Our clients generally want to get started as soon as possible, so we will design and estimate the base portion of their project to get permitting underway while we are refining the design and pricing for finish elements or alternates.” In a recent example, a convenience store client contracted for the base portion of a new station, and asked the Lepori team to develop pricing for a restaurant tenant improvement after he selected the vendor. The Lepori team had a rare opportunity recently to deliver two buildings featuring identical programming with one being hard-bid and one being design-build. The first multi-tenant building we delivered on Big Fish Drive for Outlets at Legends was hard-bid. When we took the lead as designer-builder on the nearly identical building next door, we reduced design and construction costs. The owner elected to apply cost savings to expanding their parking lot, because their focus was on increasing value rather than saving money. “The Lepori team was able to stretch our clients dollars to finish additional work,” explains Frank. Founder John D. Jacksons and his son Cory own and manage a chain of 230+ Jacksons Food Stores throughout the West, so they clearly believes in convenience. The Idaho family cares enough about being efficient to own and operate a wholesale distributor of groceries and a wholesale transportation firm that delivers fuel to their Chevron, Shell, and Texaco branded convenience stores in six western states. 4. Knowing what is expected. Reshuffling resources took on a new meaning with veteran Lepori Superintendent Dale Hodes. In 2009, when the majority of construction workers were being laid off in Nevada. Jacksons hired Dale to handle store maintenance in the region, thanks to his excellent knowledge of Jacksons’ facility requirements. Because Dale’s first love is building things, he returned to FLC in 2013 when new construction demand was picking up. He remains a go-to for Jacksons projects. “We really appreciate the chance to work collaboratively with a quality national firm,” Frank concludes. “Jacksons keeps us busy doing the kind of work we really enjoy.” In good and bad times, on small and large projects, the goal remains finding the most efficient, reliable way to get the work done, because convenience clearly matters. We asked Wooster High Student Kate Bowman to share her photographs and impressions of the architecture at her school, which opened in Reno in 1962. Designed by the local architectural firm of Ferris, Erskine and Calef, it was remarkable for it's open feeling with large spans of windows. Today, as school designers worry about windows compromising student safety, it's fascinating to get a perspective from Kate, a student in the International Baccalaureate program and the daughter of our estimator, Scott Bowman. "I feel as though having windows in my school impacts the learning of me, and my classmates. Being able to see the nature outside of your classroom gives students a place to look and reflect when they are stuck on a concept, or just need a moment of peace." "It is also nice to have natural light in a classroom; some of my teachers turn the lights off if we’re watching a video through the projector, and it helps to have natural light still peering through the windows so we can see our paper enough to take notes." "When the seasons change, I like to watch the weather through the windows in my classrooms. I especially love snow, so when it snows I enjoy watching it through the windows. My mom is a teacher and has worked in a windowless classroom for the past few years. Her room is the one they give to new teachers because no one wants to work in a room with no windows. The lack of windows makes the room feel stuffy and unwelcoming. You have no sense of time of day in her room, and it gives a feeling of detachment from the rest of the school. " "I feel windows are an essential part of our learning, as students, as well as the comfortability of students and teachers in our workplace," Katie concluded. To revitalize Wooster High School, the Lepori team replaced all windows on the 1962 campus. Work included asbestos abatement, selective demo and carpentry, flashing and sheet metal, sealing joints, painting and some mechanical and electrical improvements. 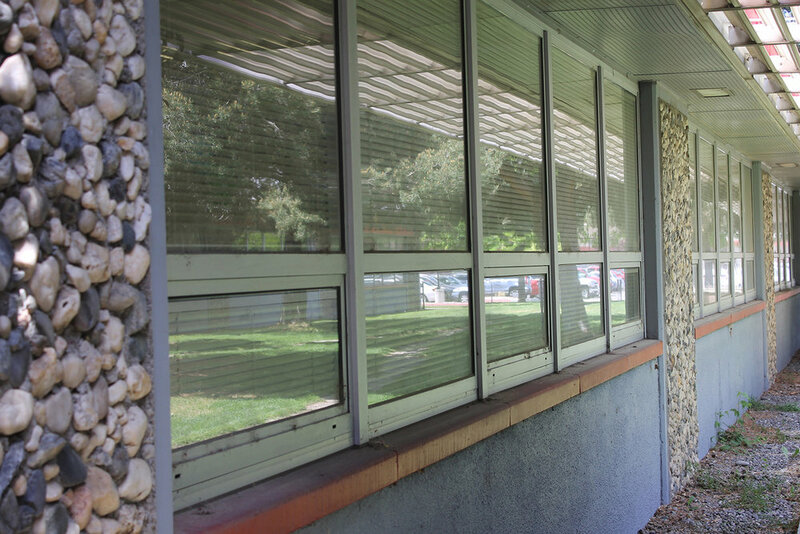 The Lepori team salutes Kate Bowman for capturing the simple lines and beautiful windows of this mid-century gem of a high school.